Follow our discoveries on our blog! We are studying the combined ecological and evolutionary consequences of global climate change and grazing pressures by nomadic pastoralism in northern Mongolia. The project is a collaboration involving the faculty in Ecology & Evolution in the Department of Biology at the University of Pennsylvania together with collaborators at the Academy of Natural Sciences of Philadelphia, the National University of Mongolia, the Mongolian University of Science and Technology and the Mongolian Academy of Sciences. The project is supported by a 5-year (2007-2012) grant from the NSF Parternships for International Research and Education (PIRE). 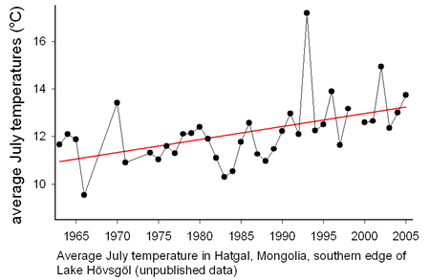 Some of the most extreme temperature increases associated with global warming are expected to occur in northern Mongolia, and increases in both temperature and the length of the growing season are already apparent. The ecology of northern Mongolia is of special interest because taiga forest and steppe grasslands come together there and because the steppe vegetation is heavily grazed through the activities of nomadic herders. Our research and educational outreach focuses on the synergistic effects of grazing and climate change on taiga forests and steppe grasslands. Most of the research will be conducted at an established field site located on Lake Hövsgöl, at approximately 50°N latitude and 5000 ft. elevation. Advancing the training of undergraduates and graduate students from Mongolia and the U.S. is a major goal of the project. We will recruit U.S. and Mongolian students into the Ph.D. program at Penn, and both undergraduates and Ph.D. students will be directly involved in the field research. In addition, the U.S. scientists are committed to offering courses in Mongolia for the scientific community during the summer field seasons. These courses cover topics related to the research as well as broader subjects in evolution and statistics. Outreach activities planned in association with the annual Mongolian summer festival will be used to help educate the local Mongolian people about global warming, sustainable grazing and the research being conducted. The collection of data that are of great practical importance to the Mongolians, who are actively developing policy on land preservation and management, and to scientists worldwide, who strive to understand the future consequences of global warming. Capacity building within the Mongolian scientific community. Training U.S. students in a way that encourages their continued involvement in global research. Career development of young U.S. scientists, including undergraduate students, graduate students and young faculty members at Penn.